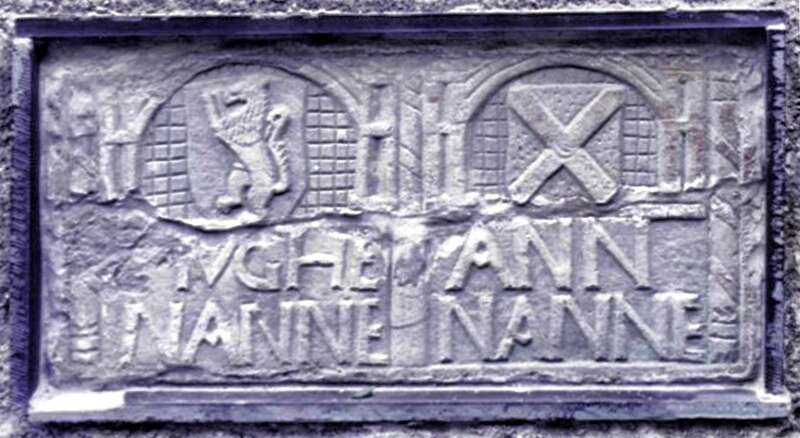 Hugh Nanney Hên was a very rich man and rebuilt Nannau on a ‘palatial’ scale around 1581. Bricks from this building can still be seen in the back wall of the current house as well as a verse by a local bard Sion Philip (Phylip) and the Royal Arms of Elizabeth I. Carved stones were also set into the wall of the East Pavilion Wing (now demolished). One Welsh bard wrote of the house, “The height was remarkable… no carpenter had ever got as near heaven as the one who measured the roof!”. “The chimneys attracted attention and the angular roofs, the long staircase, a hundred lofts, and sixty doors, the white washed clock tower with 300 steps, the oaks of the roofs covered with slates and lead, forming 12 great ridges or crests and the skilful carving of saddle pommels on the ridges, the glass showing towards Cader Idris, and parlours and the chambers, and the portals”. However, Hugh had important enemies, including the Llwyn family, the Lloyds of Rhiwaedog and the Owens of Hengwrt. He even had enemies from within his own Nanney bloodline, including the Cefndeuddwr branch. Some of these cousins and neighbours were jealous of his great wealth and the fact that he put his son Griffith forward as Member of Parliament for Merioneth in 1593 against John Lewis Owen of Llwyn. As a result they accused him of “cutting and carrying away certain trees from the King’s Majesties Forest” and making a huge profit (the ten-thousands trees were felled at Penrhos between the rivers Mawddach and Wen which is now part of Coed-y-Brenin Forest). 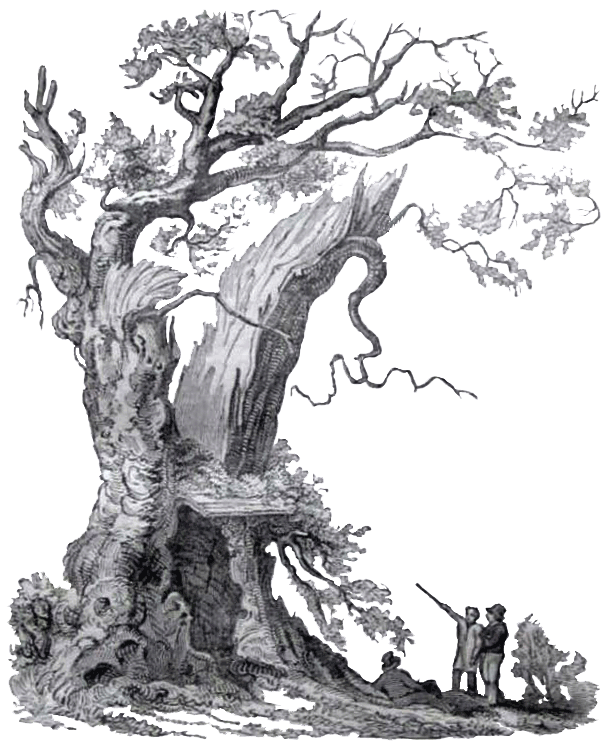 The trees were cut down between 1588 and 1603 and were sold to two Englishmen, John Smith and William Dale (which they converted to charcoal and built an Ironworks nearby). One of the arguments in court was that the trees were of poor quality and could not be used for building and were only suitable for use as charcoal. The fine of £1500 was based on the trees being worth three shillings each. He did not pay the £1500 fine levied by The Exchequer (over £2 million in todays money) and as a result Hugh and his son Griffith were held prisoner in Fleet Gaol, Hugh for two years. Whilst in prison, Hugh wrote various petitions, in one he described himself as, “an old man above sixty years, having thirty-seven children and children’s children”. Although he was freed from prison in 1608, the court process lasted until 1610 and his fine was reduced to £800. As the annual income from the Nannau estate was only £300 and with his dowries for five daughters and education for his sons, not to mention the expense of the new mansion, Hugh left a debt of £1022 to his son when he died in 1623. An appeal to the Court of Star Chamber ended in 1614/15 and resulted in one of the accusing witnesses Rowland ap Ellisse being found guilty of perjury. He was deprived of his office of Justice of the Peace, imprisoned and forced to pay Hugh Nanney £100. An appeal to the Court of Star Chamber resulted in one of the accusing witnesses Rowland ap Ellisse being found guilty of perjury. He was deprived of his office of Justice of the Peace, imprisoned and forced to pay Hugh Nanney £100. It is thought that Hugh Nanney Hên’s house suffered the same fate as other houses in North Wales, including Caergai and Ynysmaengwyn and was destroyed by Oliver Cromwell’s troops in the mid-1600s. He was still a popular figure at when he died with eleven Welsh bards writing competing eulogies for him.